Randy Finch's Film Blog: Revised SOPA: Still a Flawed Anti-Piracy Law? Revised SOPA: Still a Flawed Anti-Piracy Law? 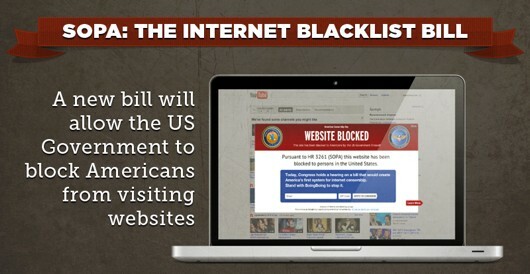 Opposition to legislation known as the Stop Online Piracy Act ("SOPA") is having an effect. On Monday Dec. 12th, 2011, as the bill moved toward a Thursday Dec. 15, 2011 markup (and vote?) in the House Judiciary Committee, a number of minor changes (known as a manager's amendment) were added by frightened supporters in an effort to clarify that the bill's main targets are foreign "rogue" websites and not just broad censorship of the Internet by a few big media companies. Still, once an off-shore domain name had been flagged as a possible infringer by a big Internet advertiser (like a movie studio or record company), SOPA would require an Internet Service Provider to block ALL web browser requests for that domain name. In practice, a site (like the next YouTube?) with just one alleged infringing video could be given an "Internet death sentence." Granting big content companies so much power (i.e., domain name blocking and filtering - that might prevent a new and valuable service from taking hold) has set off alarms at popular sites like Wikipedia and Google and among Free Speech and Net Neutrality activists. The MPAA and other advocates for SOPA argue that the powers in SOPA are measured and that they are just trying to make the Internet more secure for content creators. But groups as diverse as the Tea Party and Occupy Wall Street have united against SOPA - arguing that the proposed legislation involves a fundamental shift away from a "free" Internet and toward government intrusion and potential impingement of Free Speech. For example, on Tuesday Dec. 13th, 2011 conservative Republican Representative Darryl Issa issued a press release saying: "The manager's amendment retains the fundamental flaws of its predecessor by blocking Americans' ability to access websites, imposing costly regulation on web companies and giving Attorney General Eric Holder's Department of Justice broad new powers to police the internet." And Google Executive Chairman Eric Schmidt reviewed the manager's amendment and warned that the revised bill would still "criminalize linking and the fundamental structure of the Internet itself." SOPA has a lot of big media money behind it - but the opposition is growing. Nevertheless, with the movie industry in a panic about collapsing DVD sales and falling attendance at the theaters, new anti-piracy legislation seems inevitable. An alternative bill entitled the Online Protection and Enforcement of Digital Trade Act (OPEN) has been proposed that provides a mechanism for rights-holders to file petitions against "rogue" foreign sites with the International Trade Commission ("ITC"). The main difference between SOPA and OPEN is that OPEN treats alleged copyright infringement emanating from offshore sites as an international trade problem - without giving big media companies the awesome power of an "Internet death sentence." Instead of domain name blocking and filtering, the ITC's primary enforcement power under OPEN would come from actions against credit card processing companies - essentially drying up the funds to off-shore "rogue" sites.